There may be a metal plate under the pickups. There’s one on the Thunder II, which has the same neck pickup, but there isn’t one on the Concord I . If there is, run a wire from the plate to one of the pot bodies. 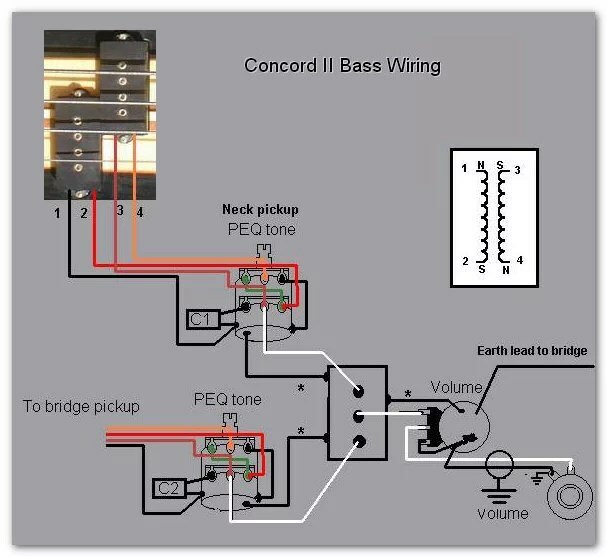 We can only show what the connections to the neck pickup should be, we’ve not sure of the type of pickup used in the bridge position. The black and white diagram at the top right shows which end of which coil of a humbucker connects to each of the four wires to the PEQ tone control, that may help in identifying the wiring to the bridge pickup. Asterisks (*) indicate these wires may be either plain wire links or the screen wires if screened leads are used between the PEQ pots and pickup switch and volume pot and pickup switch.